If you want to remove an extent from the scale-out backup repository, you first need to evacuate backups from this extent. 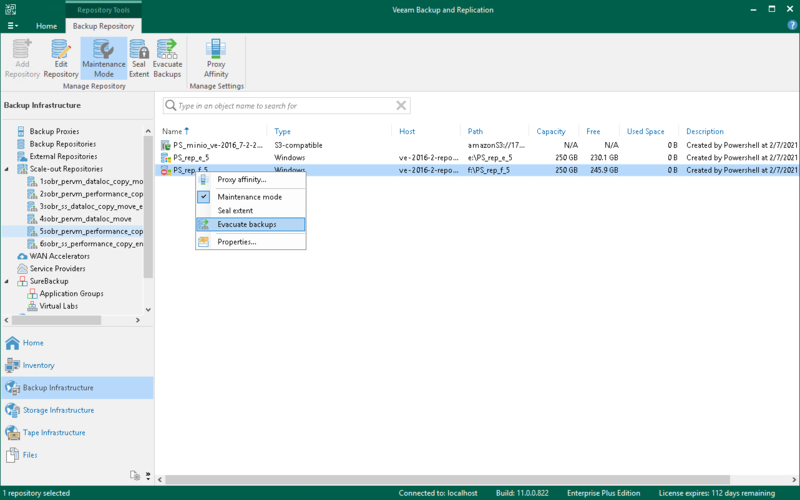 When you evacuate backups, Veeam Backup & Replication moves backup files from the extent to other extents that belong to the same scale-out backup repository. You must put the extent to the Maintenance mode before you evacuate backups from it. For more information, see Switching to Maintenance Mode. [Recommended] Stop and disable jobs targeted at the extent from which you plan to evacuate backups. In the inventory pane, select the scale-out backup repository under Scale-out Repositories. In the working area, select the extent and click Evacuate Backups on the ribbon or right-click the extent and select Evacuate backups. If you have disabled jobs, enable them. After you evacuate backups, you can proceed to removing the extent from the scale-out backup repository. For more information, see Removing Extents from Scale-Out Repositories.